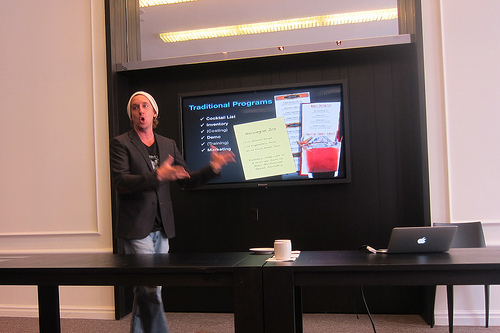 When I spotted Tobin Ellis‘ seminar on Left of Center Beverage Programs at the Industry Invitational for Manhattan Cocktail Classic, I knew I wanted to attend. I had previously attended his Drink Engineering seminar at Nightclub & Bar back in March and found him to be an exceptional speaker. What is left of center? Breaking “the rules” and still run a successful bar. We went through several slides but the one that summed it all up was the best. Previously I had learned a bit from Tobin about the science of thirst. I hope he teaches a seminar on just this one topic next. It’s endlessly fascinating. Give your guest an overly sugary drink and it kills their appetite and therefore their thirst. Instead, you want to start with something more on the bitter side. Or better yet, something that’ll dry out their mouths and get them thirsty. Drinks with citrus work. So everyone is doing a speakeasy type bar. Forget them. What’s going to work for you in your spot? So it’s trending towards fresh. Tobin said you could get great drinks without becoming a gardener or a farmers market groupie (my words). He recommended a product called Perfect Purees of Napa Valley (fair warning- they sponsored this seminar). He did caution though you want a product that is cost-effective yet still taste great. He went on to talk about Dress the Drink garnishes which he uses for his famous events. Who are some of the biggest customers at your bar? Don’t forget to cater to the 21-27 year women. The sweet drinks? Those are for them. Invert your drink recipe ratios and they’ll go for these drinks. I wanted to say something about this but thinking back to my dark days of Amaretto sours and French Martinis, I let it slide. Hello! Bar owners should get drunk at their own bar. Is the lighting good? Too harsh? Tobin talked about the time a bar owner didn’t understand what his customers were experiencing on the other side of the bar until he drank one night and found the lighting was way too harsh. 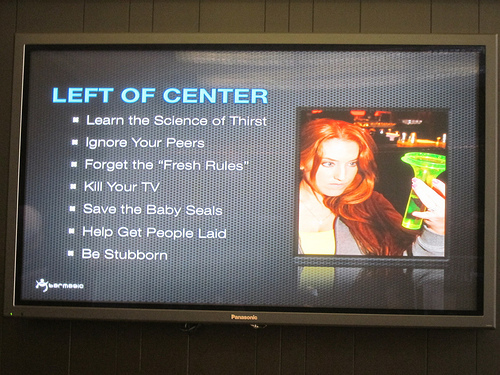 But most of all, to run a successful “left of center” beverage program, you’re going to have to be stubborn. Tobin recounted a time he was revamping a program in Hawaii and he decided to do a deconstructed Mai Tai. He knew the bartenders there would be resistant until they tried the drink. It’s still a best seller. 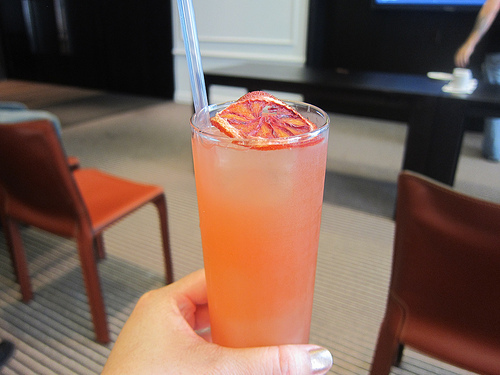 We tasted a drink that featured Perfect Purees and a Dress the Drink dried orange wheel garnish. We had fun trying to come up with names for this drink. The tartness came exclusively from the puree. There were no fresh juices in this yet it tasted delicious. And it perfectly dried out our mouths. Time for another drink. This entry was posted in alcohol education, bar snark, bar stories, bars, bartenders, cocktail week, cocktails, history, hot bartenders, spirits, the minty, travel and tagged alcohol education, andaz 5th avenue, bar, bar program, barmagic, dress the drink, garnish, left of center beverage programs, manhattan, manhattan cocktail week, mcc, ny, nyc, perfect purees of napa valley, seminar, theminty, tobin ellis, travel. Bookmark the permalink.